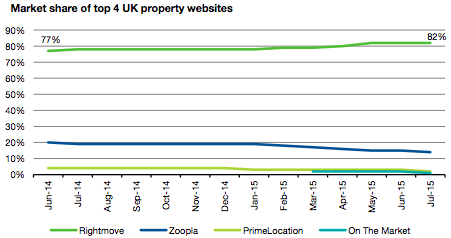 Estate agents' much-hyped competitor OnTheMarket is going nowhere fast. 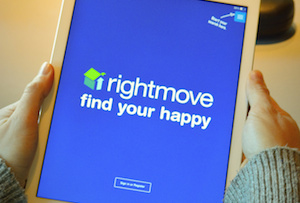 Estate agents may moan at any opportunity about the havoc the internet has wreaked on their business model, but their barbs are bouncing off Rightmove, which is cementing its position as by far the largest and most popular online property portal. OnTheMarket, estate agents’ answer to the perceived duopoly of Rightmove and Zoopla, looks like a bit of a damp squib at the moment. The number of people saying they use it to search for properties and lettings has fallen in recent months, according to research by analysts Liberum. Which property portal do you use when searching for sales? But that doesn’t look to have helped Zoopla much. More people say they use it to look for houses to buy, but its share of rental searches has fallen. Meanwhile, its market share was in steady decline after OnTheMarket launched in January with the proviso agents on its site can only list on one of Rightmove or Zoopla, although it said in August it had started recovering. Which property portal do you use when searching for lettings? It’s now ‘the UK property portal of choice,’ the Liberum analysts said. ‘We see little incentive for estate agents to leave the clear market leader as the shift to online sales continues.’ And where estate agents go, customers will follow.